TALES FROM THE CRYPT #24 SPLASH PAGE 1 (1951) Media Type: Pencil and Ink Art Type: Splash Page Artist(s): Wally Wood (pencils & inks) The multi-talented Wally Wood showcased his fine talents for horror and fantasy in this spine-tingling splash from Tales From the Crypt. This Tales From the Crypt #24 splash is from the COVER horror story titled: Scared to Death! 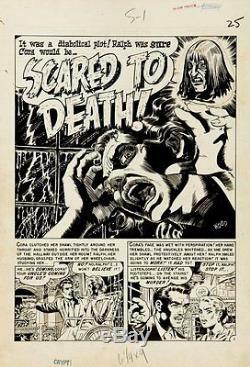 WOOD HORROR fan-addicts, take note -- penciled and inked horror splashes done solely by Wally Wood are far and few between, in fact, this great Crypt splash has the portrait of the Crypt Keeper at the upper right as pasted on ALL DRAWN original art, drawn by Al Feldstein, and NOT a Photostat! This moody title chiller, featuring the hallmark Wood lighting effects, features a babe getting ready to be KILLED! Splash has an image area of 13" x 18", and the art is in Excellent condition. Please find out more about me and my other items here. The item "Wood, Wally TALES FROM THE CRYPT 24 TITLE SPLASH PG 1 Large Original Art (1951)" is in sale since Saturday, May 10, 2014. This item is in the category "Collectibles\Comics\Original Comic Art\Splash Pages". The seller is "romitaman" and is located in Ravenna, Ohio. This item can be shipped worldwide.